The Blizzard artist site Sons of the Storm has updated the full size version of the Diablo artwork featured on this year’s Blizzcon logo, as well as the King of Hearts in the Diablo poker set. It’s a piece by Glowei, and the full view gives us larger size, as well as a better look at Diablo’s new horns. You even get a glimpse of one of his weird side mouth things, which were better shown in the mandatory shot of him roaring in the introductory cinematic. Nothing is yet known about how Diablo will appear in the game; after all, he, Mephisto, and Baal were defeated and had their soulstones smashed, presumably exiling their spirits back to the Burning Hells in a weakened state. 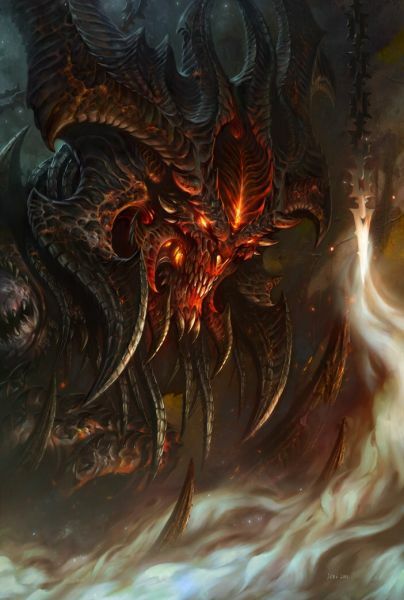 We know that two other demons, presumably Asmodan and Belial, are now the strongest forces in the Burning Hells and are organizing the demonic invasion of Sanctuary that is the prime drive behind Diablo III’s plot. So what is Diablo’s role? It’s quite a large piece so find it after the break. Incidentally, for anyone who retains inexplicable doubts as to the identity of the red, horned demon who roars in the cinematic for Diablo III (exactly as Diablo did in the D1 and D2 cinematics), this image is captioned “Diablo—Lord of Terror” on the SotS website. Thanks to KLS for the tip. Where are the winners of the Holiday Card contest?